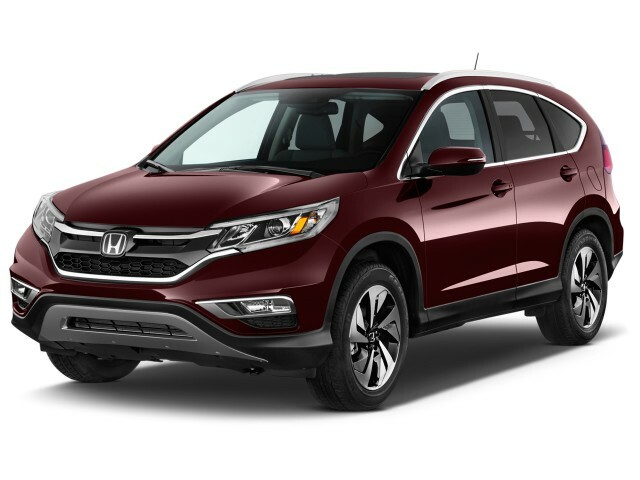 With added features at lower trim levels this year, you may find that the 2015 Honda CR-V EX has enough bells and whistles to keep your family happy at a reasonable price. The 2015 Honda CR-V has received a number of styling upgrades that give it a slightly more upscale look, eliminating some of the grey-plastic grimness of its predecessor--which had been designed during the depths of the recession. On the outside, there's a bit more chrome and the lights are more elegant; inside, the materials are better and Honda has entirely redesigned the console. The basic shape of the current CR-V is the same as the model launched for 2012, an essentially boxy wagon-shaped vehicle with a fairly vertical rear end. The upswept triangular third window on each side adds a bit of flair (at the cost of rear three-quarter vision from inside) to a silhouette that can appear ungainly, even bulbous, from some angles. And the very tall tailgate underscores the CR-V's basic SUV shape, gaining families valuable cargo room as a result. It's a businesslike design, but not necessarily all that graceful or pretty. The new grille incorporates the new Honda design first seen on the 2015 Fit, focused on a larger central horizontal bar in glossy black. There are more chrome accents, and the entire grille and headlight ensemble is now outlined with chrome. The daytime running lights are LEDs (on all but the base LX model), and the lower bumper and front fascia receive similar stylistic upgrades. At the rear, the taillight shape remains the same, but the bulbs are now LEDs instead. A chrome "moustache" dips under the rear window for a dressier look, replacing the former black plastic panel. Honda has also entirely replaced its array of 17- and 18-inch alloy wheels, again working to provide designs that dress up the car and make it look more elegant and upscale. Inside, the straightforward elements of the dash remain, but soft-touch materials are used on the dash surface and more touch points, including stitching on the edges. Those stitches are only stamped into the plastic, so they should look chintzy, but it actually succeeds in looking nicer--and we expect it to remain durable in the presence of kids or spilled drinks, too. Remaining hard plastics have high-quality graining, matching well with the soft-touch surfaces. For a high-volume and essentially sensible vehicle, we appreciate Honda's restraint in avoiding "edgy" new styling cues that often fall short on functionality. It has either the cluttered and overwrought look of Honda's larger Pilot crossover, nor the strange multiple tiers and asymmetry of the Civic. The shift lever is still housed in a fitting that protrudes from the lower center of the dashboard, but Honda has entirely redesigned the console between the seats. The side-mounted armrests on each front seat are gone, replaced by a padded cover over a storage bin and a forward section with a series of trays, slots, and cupholders. The previous bin had a plastic roller cover, so this is definitely an improvement. That bin now houses a pair of USB ports, an HDMI jack, and a 12-Volt outlet, with a second 12-Volt outlet at the very front of the console under the dash. Honda has enlarged the optional display audio system as well to incorporate a seven-inch color touchscreen, considerably larger than the previous five-inch display. One jarring note remains in the dashboard, though: Honda's three-dimensional instrument faces under the clear glass cover over the cluster. In an age of crisp multicolor cluster display screens, the instruments manage to look both gimmicky and cheap at the same time. The 2015 Honda CR-V has a new and updated powertrain, largely to boost its fuel economy ratings. But like its predecessors, its performance largely fits its mission. 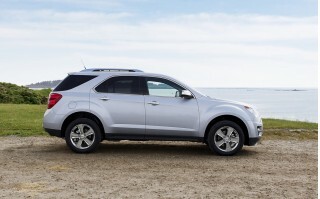 It's perfectly adequate for families, without any fancy V-6 or turbocharged engine. If it has a flaw, it's that the entire driving experience is more than a little lacking in excitement. The 2015 CR-V stays with the traditional 2.4-liter four-cylinder engine, but it is an EarthDreams direct-injected unit, rated this year at an unchanged 185 horsepower and but a slightly higher 181 lb-ft of torque. Honda's throttle is now a "drive-by-wire" system that analyzes what the driver is asking for and controls the powertrain management software accordingly. You'd never know it, though: Press the pedal, and the CR-V accelerates on cue, with smooth power delivery. There's none of what the car magazines used to call "neck-snapping acceleration," but few family vehicles offer that and their drivers likely wouldn't use it anyway. The quest for ever-rising fuel economy means that the 2015 CR-V comes with an "Econ" button like the rest of the Honda range, complete with green leaf outline. Press it, and everything gets slightly slower, and the ventilation gets a bit more sluggish. It's tolerable, however, unlike earlier Econ settings on other Honda models that felt almost dangerously slow. 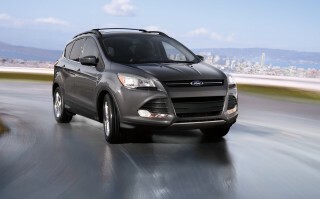 The all-wheel-drive (AWD) system is aimed more at all-weather security than any kind of real off-roading. 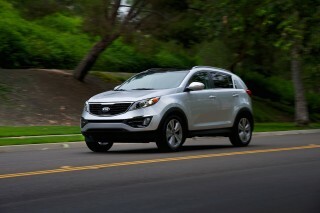 It'll get you to a campsite or the head of a hiking trail, but its strength is on snow-covered roads and slippery mud. The so-called Real Time AWD system doesn't require the front wheels to spin before sending more power to the back. AWD is an option at all trim levels, and Honda rates the towing capacity of the 2015 CR-V at 1500 pounds. The 2015 Honda CR-V scores big on interior room and cargo capacity, along with a clever folding rear seat that combines several operations into a single pull of a lever. For owners who carry kids and stuff routinely, it's hugely practical and one of the best picks on the market, assuming you don't need a third row of seats. The interior could almost be that of a minivan, with high seating positions for five but a very low floor in the load bay, despite the need to accommodate optional all-wheel drive. The front bucket seats are soft but comfortable, lacking only a little side bolstering to hold riders in place on curvy roads. The rear seat is contoured for two adults in the outboard position, with adequate legroom and headroom, but three kids will fit in a pinch. The floor between the seats is almost flat as well, a pleasant surprise for the center-seat rider. Like the Fit subcompact with its Magic Seat, the CR-V's rear seat-folding arrangement simply outshiens nearly any other compact crossover. A single-handed pull of one strap folds one side of the rear seat completely. The back seat's lower cushion tumbles forward into the footwell, the headrest angles forward, and the seatback flips over it--bringing the folded seat into a completely flat position, tucked into the footwell just behind the front seat. The load floor is the lowest in the class, Honda says, at just under 24 inches above the ground. With the rear seatbacks up, the CR-V offers an impressive 37.2 cubic feet--but fold down the back seats, and you get 61.4 cubic feet. The cargo floor is lengthy, although it has a slight step. Between the low floor and the high ceiling, the cargo bay appears cavernous. The quality of the interior materials has been elevated for 2015, and the CR-V no longer appears as grim and bargain-basement as it did in previous years. Soft-touch surfaces on the dash and the doors pair with fine graining on the hard plastics, and Honda has improved noise insulation this year as well. The result is a largely quiet ride, except under hard acceleration when engine revs can rise quickly to a much noisier level. From the outside, the engine's new direct-injection system also makes a steady ticking noise at idle. It's not unpleasant, but it's different. The Honda CR-V has traditionally done well on safety tests, but a new type of crash test exposed a weak point in previous model years of CR-V. With safety a crucially important selling point, Honda expects the redesigned 2015 CR-V to earn top ratings from both the Insurance Institute for Highway Safety (IIHS) and the National Highway Traffic Safety Administration—and so far that's proven true on the IIHS side. Previous CR-V model years scored the top rating of Good on all IIHS tests except the new small overlap front crash test, on which it received a rating of 'marginal'--only one grade above the lowest rating of Poor. But Honda redesigned the compact crossover's front crash structure, a major amount of work for what the industry considers a mid-cycle refresh of an existing model, and this year's model now gets a top 'good' rating for small overlap. In National Highway Traffic Safety Administration (NHTSA) testing, last year's CR-V has earned five-star results overall, as well as in frontal and side impact tests. 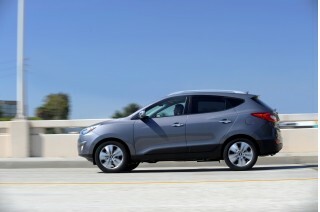 Yet this year's model, in a retest, earned just four stars for frontal impact, and an overall score of four stars. From inside the 2015 CR-V, visibility to the front and sides remains good, with carefully designed and very slim windshield pillars giving good forward vision over a low cowl. We also appreciate that the rear-seat headrests can fold down to open up the view in the rear-view mirror--a feature we think all vehicles should offer. Rear three-quarter vision, however, is a different story. Thick roof pillars, a high tailgate window, and small quarter windows badly limit over-the-shoulder visibility--making the standard rear-view camera a must-use. Other safety equipment includes six airbags--front, front-seat side, and side-curtain--wide-angle side mirrors, and a suite of new electronic safety systems. Added this year is Honda LaneWatch, the clever camera mounted in the right door mirror that shows a video image of the right-hand blind spot on the center display whenever the driver signals for a right turn or lane change. It's included in all but the base LX model. The new active-safety systems include adaptive cruise control and a Lane Keeping Assist that incorporates both lane-departure warning and steering correction. There's also forward-collision warning, and a collision-mitigation braking system that automatically applies the brakes if the vehicle senses a collision is imminent. Unfortunately, those features are available only on the top-level Touring trim; but there, they do allow the CR-V to achieve the IIHS Top Safety Pick+ nod. The Lane Keeping Assist system includes not just keeping the car from drifting out of its lane, but an actual lane-centering function (Honda calls it "lane tracing"). But on a prototype vehicle we tested in October 2014, we found it somewhat unpredictable. The dashboard icon that indicated when it was off or on was hard to read at a glance--the former was outlines of lane markers, the latter simply filled in the markers--and the system turned itself off below 45 mph. Moreover, it only held the car in the lane on gentle sweeping curves, disengaging and beeping to alert the driver to take control on sharper turns. When it did keep the car in lane, a subtle but definite force could be felt through the wheel as the car corrected its course. The 2015 Honda CR-V is offered in four trim levels: the base LX, the mid-level EX, a slightly nicer EX-L, and a new top-of-the-range Touring version that's been added this year. While it's not a trendsetter in feature offerings, Honda has put considerable effort into adding equipment at each trim level to improve its perceived value for money. None of the basics are missing, and mid-level trims this year offer more standard features than before, though to add the latest electronic safety systems, you have to step up to the top-level Touring model. The base CR-V LX can be distinguished by its black door mirrors and door handles; it's the only model where those items aren't body color. It includes air conditioning, cruise control, a tilting and telescoping steering wheel with integrated controls, Bluetooth pairing, a pair of 12-Volt power outlets, and there are two new addition to all models for 2015: rear-seat heating and air-conditioning ducts, and extendable sun visors. Honda only expects 1 in 20 CR-Vs to be ordered with the base trim, however. The popular mid-level EX and the slightly fancier EX-L will represent the bulk of sales, adding the most popular options in carefully calibrated packages. For 2015, the LaneWatch system that shows a video image of the car's right-hand blind spot when the driver uses the right turn signal is standard on the EX and above, as are LED daytime running lights in the headlamps. The EX also gets a 10-way power adjustable driver's seat, heated front seats, keyless entry and pushbutton start. Other EX upgrades include a sunroof, 17-inch alloy wheels, a second USB jack, a security system and cargo cover, and variable-speed wipers. This year, the audio system sports a new, larger 7-inch touchscreen display. As before, it can handle SMS texting (reading and pre-set replying) and has a Pandora app, with the screen capable of displaying cover art, turn-by-turn directions, and trip computer data. You also have the option to display wallpaper (your personal pictures). The EX-L adds leather on the seats and steering wheel, a dual-zone climate control system, satellite radio, a heated side mirror, an upgraded audio system, and new this year, an auto-dimming rear-view mirrors. Then the EX-L Navi model adds an in-dash navigation system, plus HD Radio. The new top-of-the-line CR-V Touring trim starts at $33,600, almost $10,000 more than the base LX model. It adds larger 18-inch alloy wheels, a power tailgate, memory for the driver's seat position, and a suite of new active-safety systems: adaptive cruise control, Lane Departure Warning, Lane-Keeping Assist, Forward Collision Warning, and Collision Mitigation Braking. It also has turn-signal lights built into its door mirrors, the HomeLink system, and special badging. Oddly, even the highest-end Touring still has a manually adjustable front passenger seat. The 2015 Honda CR-V gets a substantial boost in its fuel economy ratings from its direct-injected engine and a new continuously-variable transmission (CVT). Its two combined ratings are each 3 mpg higher than the previous year's CR-V, putting it toward the top of the compact crossover segment in EPA ratings. It was already one of the more fuel-efficient models in its class, but now the lighter front-wheel-drive model is rated at 29 mpg combined (27 mpg city, 34 mpg highway). Specifying all-wheel drive knocks all three ratings down by 1 mpg, for a 28-mpg combined figure, though so-called Real-Time AWD system fully disengage the rear wheels when cruising to help save fuel. The drawback, however, is that the 2015 CR-V isn't particularly fast or sporty to drive--a tradeoff we see more and more as regulatory pressure to boost fuel economy bites harder with each model year. We haven't yet tested a 2015 CR-V to see how well its real-world gas mileage matches up to its ratings, although if the 2015 Honda Fit (also now fitted with a CVT) is any indication, it should be fairly close. Most Cargo Room in it's Class. Comfortable Ride. Decent Performance. My Previous Vehicle was a Honda Accord Sport. The CRV uses the same engine so it has decent acceleration. However, it is geared differently so it struggles at times. 75 ft of cargo room, fold flat rear seats... My Previous Vehicle was a Honda Accord Sport. The CRV uses the same engine so it has decent acceleration. However, it is geared differently so it struggles at times. 75 ft of cargo room, fold flat rear seats are awesome. With snow tires, this CRV will handle well in adverse driving conditions. However the AWD is not as responsive as the SUBARU. Fuel efficiency is the best in class. On freeway I got up to 39mpg. Yep, that's driving I5 for 4 hours. Could use better suspension though because the shocks seem spongy around corners. However, it is a comfortable ride. I've had no maintenance issues whatsoever, except for the engine vibration. They upgraded the Software yet it seemed to make it worse after accelerating on the freeway. They say it won't harm the engine, however it's kind of suspect being that the engine vibrates the vehicle so hard. My honda accord was smooth as silk, you couldn't even tell the engine was on unless you rev it up. The new CRV's are much better all around except for the high revving turbo engine 1.5 liters of an engine would require high RPM's and I don't like loud engines. Anyway, if you have a family of 2 children, the CRV is a great choice. It feels safer and is bigger on the inside than most other SUV's and for the price and gas savings, it's no wonder you see a lot of these vehicles on the road. 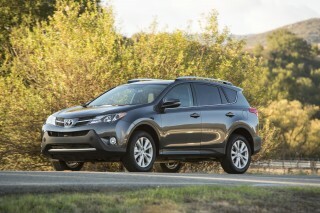 It's the most practical vehicle you can get for an SUV in this price range. It serves all purposes. These are keepers. My brother has an older CRV at 200,000 miles and it drives like new. Amazing. The Crv is a reasonable purchase. It runs well, its cheap on gas and the oil changes are controlled by computer. I do 10,000 miles between changes. It never breaks and the resale is very good. Living in Florida A/C must be cold. My 2015 Honda CR-V, the A/C is NEVER cold unless you drive at least a steady six miles at 50 MPH. The dealer showed me it was cold 43 degrees. I asked how long have you had... Living in Florida A/C must be cold. My 2015 Honda CR-V, the A/C is NEVER cold unless you drive at least a steady six miles at 50 MPH. The dealer showed me it was cold 43 degrees. I asked how long have you had it on? for the last hour he said. I said so all I have to do is keep the car running in the driveway until I need to drive it again? 90% of my trips are short the A/C gets cool, NEVER cold. The back of my shirts are soaking wet every time I drive the vehicle anywhere, except in cool weather. I've got all the windows tinted including the entire front windshield...no change whatsoever. In addition to this problem, the engine/transmission vibrates the entire vehicle at EVERY red light. Honda applied an algorithm computer fix that has done a NOTHING. This vibration will drive you out of your mind! I can't believe Honda rushed this engine/trans problem to the market without perfecting it. This is absolutely unacceptable with Honda's reputation. I have never paid $30,000 for a vehicle but trusted Honda having purchased three others that were great in years past. I am going to get rid of this CR-V and take a loss. I love the vehicle itself, but these two flaws are COMPLETELY UNACCEPTABLE. I have spoken to two others who purchased new Honda's, an Accord and a Civic...both have told me there's something wrong with the A/C Sorry to say, this is my LAST Honda. I feel at home in my new CRV it is comfortable and comes with some cool bells and whistles. I have been very happy with my CRV's performance and the amenities. It is comfortable, Sleek, and fun. I was told the mileage will get better the older it gets. First it started out at 19mpg and now I average... I have been very happy with my CRV's performance and the amenities. It is comfortable, Sleek, and fun. I was told the mileage will get better the older it gets. First it started out at 19mpg and now I average 22. I'm hoping for the 25 soon, The deal said the synthetic oil needs to go through the car a full cycle before full performance kicks in. We love every CR-V that we have owned. LOVE IT! best car I've ever owned. 2015 CR-V Touring is a disappointment !!!!!!!!!!!! Purchased the new 2015 Honda CRV EX AWD for $27000 but was surprised to see the vibration problem when the vehicle is on idle, we can feel the vibrations and they are very annoying. The mileage I am getting is... Purchased the new 2015 Honda CRV EX AWD for $27000 but was surprised to see the vibration problem when the vehicle is on idle, we can feel the vibrations and they are very annoying. The mileage I am getting is around 23 MPG which is very less than what they say. The rear view and lane assist camera are not much useful during night time since the images are very blurry and lot of spots appear on the screen which is difficult to view in the screen.